Many mappers need to make props for their maps, but don’t want or don’t have time to learn a separate modeling program. This tool allows them to make models in Hammer in a one-step process. It’s also useful to modelers who work with mappers. Propper keeps texture mapping intact, and auto-generates a physics mesh. Automatic material conversion–Turns map textures into valid model textures. Distinguishes between real textures and “tool” textures. Displacement support–outputs any displacement surface you can make (not solid). skins support–use multiple textures on the same prop. There are two versions of propper included. One is for the 2006 SDK, and the other works with both the 2007 and 2009 versions. A .fgd (Forge Game Data) file is included for both, to help you configure your props. The folders in this ZIP file mirror the folders in the SDK. For best results, unzip the file to your steamapps\<username> folder, and let your zip utility keep directories intact. After installing, you should change your game configuration a bit. Open Hammer under the game with which you will use Propper, and click Tools:Options. Note:You may need to create your custom folders in * c:\propsource\USERNAME\Your_Custom_Model_Folders_Here * in order for Propper to work. Find the section for “Game Data Files”, and click the “Add” button. Open propper.fgd when prompted (It will be right there if you installed correctly). Then Click OK or Apply to save the settings. Finally, restart Hammer so the settings take effect. Origin (X Y Z) The position of this entity’s center in the world. The model’s origin point defines how it is lit and is how the prop is positioned in a map. For static props, put the origin somewhere that lets you align the prop easily. Material path Where the model’s textures will be. Relative to <yourmod>/materials. Make sure this folder exists before running! Propper extracts material files from your mod folder or game cache, and makes a copy in this location. Surface property The physical properties of the model–affects impact sounds and weight for physics props. Concave collisions Used to make a concave collision model. If you choose no, the model will be ‘shrink-wrapped’. Auto-Center The model’s origin point defines how it is lit and is how the prop is positioned in a map. Auto-center moves the model’s origin to the center of its bounding box and is recommended for physics props. Don’t warp displacement textures In Hammer, when you move a displacement point, the texture moves with it. If you pick yes, the texture will stay in place. This determines which of your models will be affected by the entity. So if you have a propper_model entity called myModel1, any of the following entities should use myModel1here. Health Overrides the prop’s health. Setting this to 0 will make the prop unbreakable. -1 will use the default value from “Health preset”(recommended). Flammable Will it burn? Picking this enables the ‘ignite’ options. Ignite from explosions Won’t break right away if something explodes near it, but will ignite. Material Pick a texture that’s present in the original model. This will be skin 0. In this update, Valve created a new engine version called “Source Engine MP” that is incompatible with Propper. The solution is to browse to sourcesdk\bin\orangebox\bin. Find propper.exe and propper.fgd, and move them into sourcesdk\bin\source2009\bin. Then, in order to use Propper for TF2, CS:S, or DOD:S, you must use the SDK in 2007 or 2009 mode. 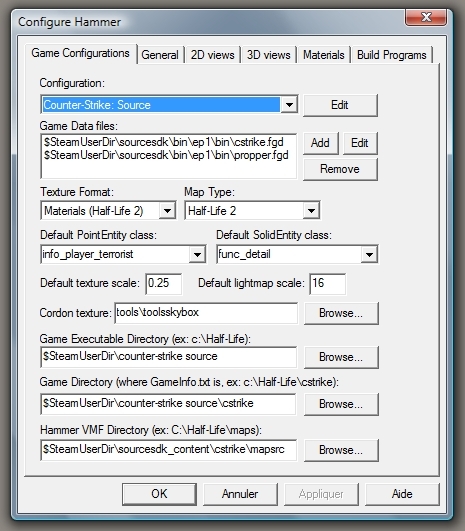 Select Source SDK 2009, and double-click “Edit Game Configurations”. Add the game you want to use Propper for, and make sure you use the engine version when you want to run Propper. To run Propper in any version of Hammer, please refer to the Compiling section. This happens when you have a line break or other white space in the parameters box of Hammer. Don’t copy-paste the parameters in there. Type it in. I can’t find these prefabs I’ve heard about. Where are they? My prop’s collisions are wrong. It’s solid where it shouldn’t be. My prop’s collisions are in the wrong place. If your useing a func_brush to show propper where to make the collisions, you will need to set the origin of the func_brush in the same place as your propper_model. Models in Source use rather simple vertex lighting, whereas brushes get radiosity lightmaps. What that means in simple terms is your map gets nice soft shadows and bounced light, but props don’t. Buildings just look better when they’re made from brushes. In some cases, you can get better lighting on your props by enabling per-vertex lighting when you compile your map. In the command line of vrad, include -StaticPropLightingto enable that feature. Models that use normal mapping aren’t compatible with per-vertex lighting, so use the “Disable normal mapping” option when you use Propper. Propper quits with an error saying it can’t open such-and-such file. Be sure that you have permission to write to that folder, that it’s not write-protected, and that you have entered a valid folder. It’s also not uncommon for mappers to run into the brush/face/plane limits for a very large or detailed map. Props let you add detail to your map without pushing this limit. If a feature is used several times in a map, making it a prop will reduce the size of the .bsp and the system memory needed to run the map. Hammer’s a mapping tool! People who want to make models should learn a real modeling program like Blender or XSI. I agree, but maybe they don’t want to. For better or worse, people are more comfortable working with tools they know. The learning curve with Propper is far lower than that of the “official” tools – you use virtually the same procedures you already know from Hammer. Propper was originally meant to be a map optimization tool, but people have used it to make some very nice models. If you run the tool on a map with no brushes (displacements don’t count), Propper will crash. Thus, if making a model solely from displacements, place a normal (non-displacement) brush somewhere in the vmf file. This is an obscure bug from vbsp and I haven’t managed to track it down yet. If you use certain invisible textures (eg. clip, nodraw, sky), on a face, that face will be erased. You can lower the final poly count of your model by using nodraw on any face that the player won’t see. I don’t yet sort LOD entities by distance(because I am lazy). So always make your closest LOD FIRST, and so on. Otherwise, they won’t switch right. Propper will over-write files without asking, so make sure there are no files in your selected folders that you don’t want to lose.